My Kitchen - Perspective Two, originally uploaded by Evan Walters - The Learner Property Photographer. This is the a photo that I took after wrapping up my photo session. I've been challenged to find nine different perspectives from which to photograph a room, and as a last minute thought I thought I might try a high shot looking down into the kitchen. Turns out it is one of my favourite shots from the day. This photo was taken on an overcast day late in the afternoon (about 4.30pm, about half an hour of light left outside, but already very dark as seen in the kitchen window). This photo was lit using an on-camera speedlight (flash) bounced off the roof. 1. Always learn from your mistakes - I didn't learn from lesson one last week (establish a pre-shoot checklist) so most of my images were again shot at ISO 2000. 2. Watch reflections. The kitchen and bathroom have to be the worst rooms in the house for reflections. This photo has had a lot of manual editing to remove some ugly reflections and there are still many reflections in the shot I wish were not there. 4. When taking a three-wall shot (from the middle of the room showing three walls) stand in the middle of the room. I find the angle of the floor a real distraction in this photo. 5. I need some more basic equipment. Gels for correcting colour temperature (the fridge, stove, rangehood, and blind should alll be white in this photo, they aren't). And a diffuser to avoid over exposing parts of the photo with the flash. 6. Always save your finished work. I did a quick edit of the other photo I have posted to flickr and did not save my changes. Big mistake. I ended up correcting the perspective of the photo and have to compress it to JPEG twice (the quality of the photo has suffered as a result). To view the EXIF Info please click the image as I have posted these details on Flickr. 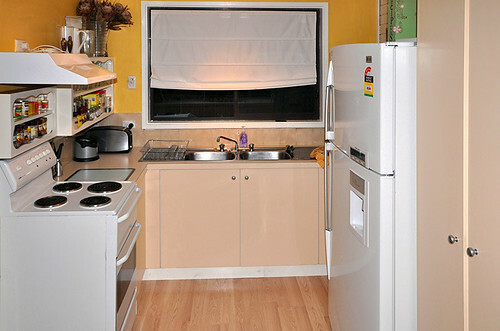 I have also posted a second photo on flickr which shows my kitchen from a different perspective. As always I'd love to have your feedback on my work.